If you've ever left the comfort of your home to go sprawl out under the stars and camp, you know how indispensable it is to have fresh coffee the next morning. 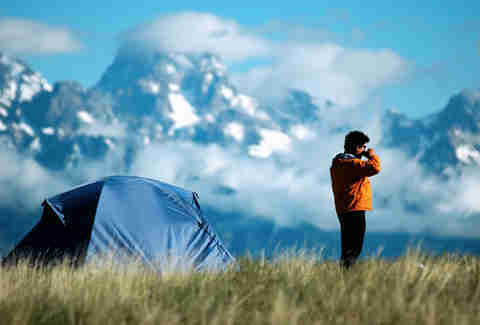 If you've never camped, here's a little tip: you'll want to pound coffee the next morning like your life depends on it. It's the best thing ever. Maybe even better than s'mores. Maybe. That said, it's not always the easiest to lug a French press or coffee maker to your campsite, especially if you're backpacking or your car's out of reach. But fear not, brave adventurer, with this one tip, you'll be making delicious cups of coffee with ease, and minimal materials. 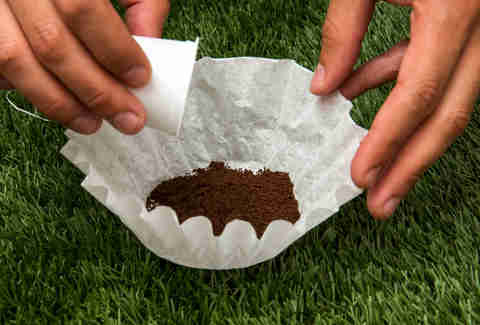 Grab a coffee filter and fill that bad boy up with about 2 ounces of ground coffee beans. But not decaf. Decaf is gross. 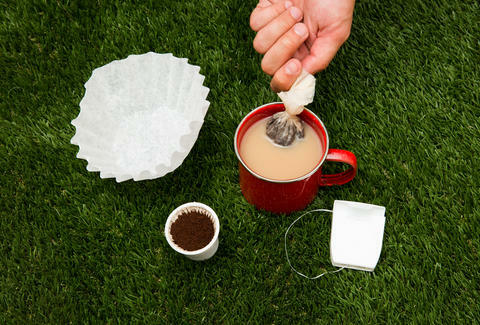 Using both of your mighty, able hands, start to make a little pouch where the coffee will sit whilst simultaneously twisting the filter to close off the pouch. 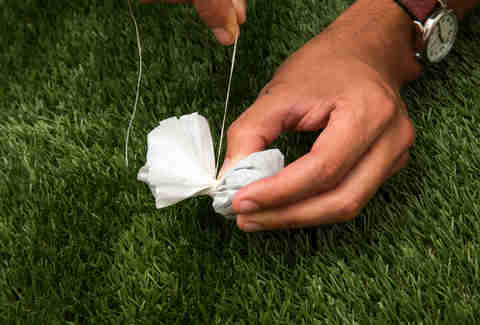 Take about 8 inches to a foot of dental floss (unflavored is highly recommended), and tightly wind it around the twisted area until you’ve got what looks like a small lumpy tea pouch full of coffee. Pour some piping-hot water into a vessel of your choosing. 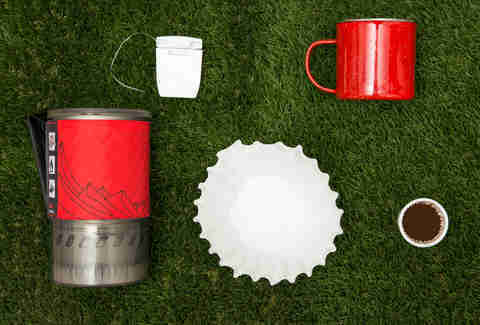 Bonus points for incredibly quirky enamel camping cups. 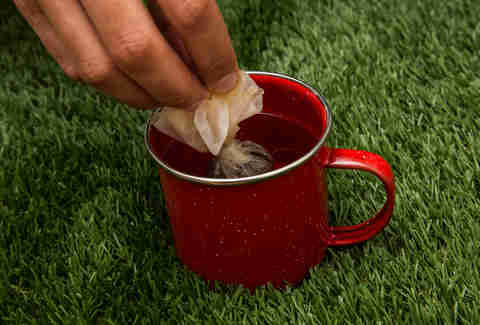 Teabag the heck out of that piping-hot enamel cup with your coffee bomb. 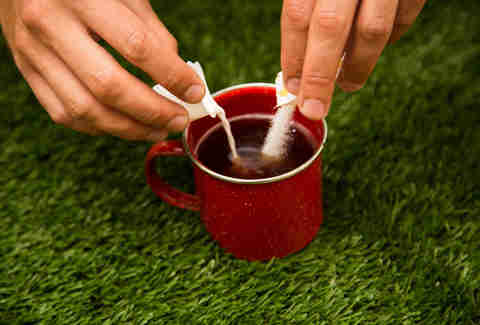 You’ll want to steep it for about 2 minutes. Add some milk, some sugar, some whiskey... whatever you want! Squeeze out those last precious drops, take a sip, let out an obnoxious "ahhhh" so everyone knows how good your coffee is, and then feel accomplished that you just made a great cup of joe without a machine. 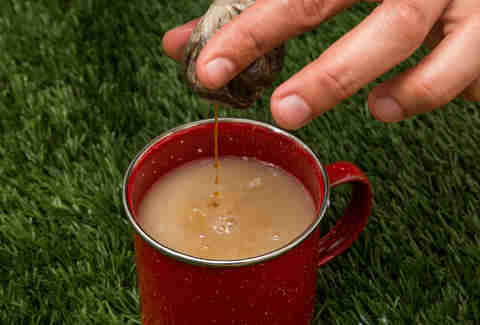 Alex Robinson is an editor at Thrillist who loves camping almost as much as he loves coffee. Follow him on Instagram for all the proof you'll need.